I have decided to enter the Paper Smooches Challenge-February Sketch. All the information is here: www.papersmoochesstamps.com that explains the rules. The sketch to follow is below. I used some border stamps to create the lines on the card. I stamped and colored the images with Copics, cut them out and mounted them on foam squares. All of the images are from Paper Smooches, which is one of my favorite stamp companies. I added some stars and I applied clear Wink of Stella to the images. I also added some black dots to the rocket ship. Sooo I saw Jennifer McGuire demonstrate this watercolor technique in a video the other day. I looked easy so I thought I would try it. It was pretty easy! White emboss the stamp image onto to waterproof paper. You then run some different color distress markers or any other water based marker across the cardstock. Then you spritz it with some water and turn the paper so that it runs. The white embossed image will resist the ink. I cut a frame from white cardstock and adhered it to Bazzill cardstock (a requirement if you could was to use a Bazzill product). Then came the pearls! I did add some sequins and a bakers twine bow. I mounted the image panel on some foam squares and set it inside the frame. I rounded the corners with a 1/4 inch Corner Chomper. Hope you like! Thanks for stopping by. Today starts Paper Smooches February Blog Hop all the details are here: http://papersmooches.blogspot.com/2014/02/february-dt-blog-hop.html#comment-form. So hop on over and participate and you could win a prize! Simon Says Stamp has a Work It Wednesday challenge that is run on the last Wednesday of each month and runs till the next month. The challenge is to use a Simon Says Stamp product from their new release or one from any of their releases. I chose to used their Clustered Leaves stencil and die to make this card. I first stenciled using 2 different distress inks on kraft card stock. For the diecut I used a new technique that I have seen on other cardmaking blogs. I die cut several layers of the leaves on white card stock and the last layer from patterned paper. I glued all of the layers together to create dimension. This way you don't have to use foam squares to get that look. It is a bit tricky and you need to use liquid glue to make sure you have some time to match up the layers but I really like the look. For the birds, I stenciled them using embossing paste mixed with a distress ink to get the blue color . The 'thank you' was embossed in white on vellum. I added some green pearls to finish. I used another piece of patterned paper behind the kraft panel and mounted it on foam squares. I plan to order some products from Simon Says Stamp's new release and I think I will make another card to enter into this challenge. Happy crafting and stay well! I mixed the embossing paste with some distress ink for the coral color and used a stencil to create the background. I die cut the flowers, used a clear button for the center and mounted them on foam squares for some dimension. I colored the bird with Copics and also mounted it on foam squares. The black cardstock with the kraft center I just ripped and placed it behind before mounting the flowers. I stamped the sentiment and attached with foam squares. AI Challenge 129-Let's Get Krafty Week Two! I decided to enter the Art Impressions Challenge 129 'Let's Get Krafty,' which is make a card on kraft paper. I love kraft paper and AI, so this was a challenge made in heaven for me. I clear embossed the background of the kraft card stock with a woodgrain block stamp. I stamped and Copic colored the Art Impressions birdhouse stamp and then framed with frames I had die cut. I white embossed the greeting and added a small brad. I have have had some babysitting duties lately for my new granddaughter, so I have been busy, but it is a good busy! The theme was Wedding or Anniversary so I chose Anniversary. I cut the frame and stamped and colored the image with Copics. I layered it on a piece of designer paper and sorry I don't know what the name is, it was in a pile that I save when I just use a bit of it so I can use it again. I added some sequins and pearls. The sentiment is embossed on vellum and I added a couple of brads to help hold it in place. No matter how hard I try to get the vellum to not bow when you heat it up it always does! I had wrapped it around and secured it but it still looked like it was bowing out. I am going to enter this card into Simon Says Stamp Wednesday Challenge. This week's Wednesday challenge was to create a card on Kraft card stock and if possible use a Memory Box die. The stamp set is Doodlee-Do from PTI and the 'thanks' is a a Memory Box die. I embossed the stamp set and then used liquid pearls to embellish the flowers. I used a few pearls on the card and outlined the outside in white gel pen. Hope you liked as much as I did, stay well. I really like the way this turned out. I used Tim Holtz Market Place die cut alphabet and Lawn Fawn Happy Everything for the sentiment. The heart is the SSS Heart Doily die cut. I think I will be entering this in Simon Says Stamps We Love Stamps Monday Challenge. Hope you enjoyed! Thanks for stopping by. 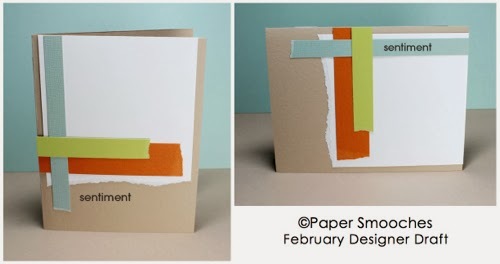 Paper Smooches is having a 'Fun & Cute' challenge that runs until February 16th. Create a card that is fun and cute and you could win some Martha Stewart acrylic blocks and a stamp set of your choice! I created the sentiment from Paper Smooches Alpha Dot stamp set. Then used their Birthday Buddies stamp set for the beaver and colored with Copics. I am going to submit this card to Papertrey Inks Anniversary challenge for today. Today it was to incorporate stripes in some way. I created a striped background on kraft paper and a striped background to the sentiment. I added twine, button and enamel dots. I silver embossed the Doodilee Do stamp set from Papertrey Ink on blue card stock. The 'hello' is embossed on vellum and attached to the card front. I just added some sequins to fill in empty spaces. I like the way it turned out and I am glad I did it tonight and didn't wait! I am going to enter this card into a contest over at Papertrey Ink. It is their 7th Anniversary and a countdown to their new releases on February 15th. The idea for today was to use a 'word' as a focal point. The other requirement is that you use a Papertrey product, mine is the candles and flames stamp. The 'happy' is a Memory Box die, and I used some postage stamp dies from SSS for the frames, and the A2 die from SSS for the bottom. I did use some Wink of Stella yellow on the flames, but it is hard to see. I stenciled a dot background on kraft paper with Colorbox white ink and added some paper, pearls and twine. This can be a birthday card, wedding card, graduation card that is what I like about the sentiments with the stamp set, they are very versatile along with the stamps. I wanted to post some of the Valentine's Day cards that I made so far this year. I used Neena Desert Storm card stock and SSS Doily Hearts dies to cut out the hearts. I used washi tape on the base and then laid the die cut piece on top. I added some red pearls and the 'love' is from SSS Love This stamp set, I just stamped the Love part of the stamp. This is a Purple Onion stamp "Poppy" by Stacy Yakula. I love her collection. I stamped and pieced the image and added the heart balloon which is SSS Only Have Eyes For You stamp set, and heat embossed the Love You on the balloon. I wanted to try my hand at the embossing paste again. I just love working with embossing paste there is so much you can do. I mixed the paste with some Tim Holtz distress ink (Festive Berries) I wanted to get a soft pink color and it worked great. I used the Clustered Leaves stencil from SSS. The 'Love' is from Winnie and Walter, it is their newest release. I die cut vellum with the Clustered Leaves die cut and die cut the hearts with the Large and Small Doily craft dies from SSS. I also colored the vellum with a Tim Holz distress marker in Crushed Olive. I added some sequins and rounded the corners. I really like the way this turned out and I am going to play some more with embossing paste.